Loss Weight The Easy Way with Hypnosis and Keep It Off. You know that most diet programs do not work, but hypnosis for weight loss does work. The reason is other diet plans never deal with the root cause of why you overeat and the bad habits you have formed over the years concerning what and how you eat. Our program has solved this problem and it is one of the major keys to success. Hypnosis takes a whole new approach and you find yourself winning the weight loss battle. Our diet program provides the changes in how your mind’s thought process, changing the way you approach dieting. This is where hypnotism will help you lose weight and keep you on your journey to losing those extra pounds. The biggest problem with all these diet techniques and recipes is that you really, really want to lose the weight but your ability to have that mind change, that point where it is no longer just something you really want but it becomes a deep desire, even a sense of pleasure to do the things necessary to overcome your nemesis craving food. Many struggles with trying to quit smoking. At Omaha Hypnosis Center Jeff has seen many people who have successfully been able to stop smoking with our hypnosis program in only a few sessions and even on those rare occasions there have been those who stop in just one session. Having the ability to overcome stress and react to stressful situation correctly for many ends in failure. Our stress relief program for Omaha program has proven to be an effective ally to help people find stress relief with those stressful thoughts and reactions to events that make you anxious. Come an get your Free Hypnosis screening and see how hypnosis can help you reduce and manage the stress in your life and even help you stop smoking, lose weight and be more confident and enjoy life better. Get started with stress relief hypnosis. About Your Free Hypnosis Screening. This Will change your life. This free Hypnosis screening is just for you, this will provide you with a win-win solution… and the best part is it is free you have nothing to lose but your unwanted unneeded problem. Whether are you want to lose weight and keep it off and stop the yo-yo effect or if you want to quit smoking or learn how to manage stress to better in your life. This free screening will show you how hypnosis will improve your lifestyle and guide you into the life you desire. Our screening is designed for you, based on your needs and goals we can put a program together that will help you achieve the desired results. This way you can feel, great enjoy life more and become a member of the family of people who have lost weight and kept it off or a member of the family of people who have stopped smoking or the people who are managing the stress better in their life. The beautiful thing is managing stress affects both the weight loss and smoking cessation. Success happens because of the actions that you take. What if you felt great and you took the action that you needed to take….. If you had someone helping you that had your best interest at heart … someone who would not give up on you……a person that had the map that could help you …. Your life has a purpose, you were born the exact person that you’re meant to be. You deserve to enjoy your life. And live your life to the fullest. Look everyone has ups and downs…life tests……. that make us who we are. Know and trust yourself achieve your goals. Our hypnosis programs will help you to meet those goals. Every person is unique so are you. If you are sincere about solving your problems, take my advice and call for your free hypnosis screening, It takes about 30 to 40 minutes and at the screening, all of your questions will be answered. You have nothing to lose but your problem and it’s fun and informative. Call Now to schedule your free hypnosis screening now. Call now you’ll be glad you did, your adventure to a healthy life starts now. Losing Weight with Hypnosis Last Longer? Once you complete your program we stand behind you with a written guarantee. If you go back to your unwanted behavior for any reason, our services are available to you at no additional charge for as long as Lincoln Hypnosis is doing business. We evaluate your problem and then assess a fee. Once the fee is paid there are absolutely no more additional session charges. We stay with the problem until you are happy. Hypnotherapy can change how you approach dieting plus strengthen the belief in yourself? Hypnosis can bring you to a place where when you get up in the morning you are eager to face the day enjoying all those things that are helping you to enjoy your life now, the internal desire is gone to binge, but now you can stay in control of those urges. With our program hypnosis for weight loss in Omaha, you will be free from those box lunches, you will love drinking more water and you will enjoy your exercise routine. Don’t hesitate to get started. You are going to have a new Belief, Attitude and what you Value and it’s effect on your behavior for helping you change and become positive. Hypnosis has helped many with the inner person to feel the power to overcome obstacles that used to be in the way that you are in control of your life. Now your life has a purpose and meaning those obstacles are gone from your life. Your focused, you have a new confidence and nothing can stand in your way. Hypnosis has become a path to better health, better relationships and a better you. You can reach your weight loss goals or with any other challenges you face. So come in and lose weight with our hypnosis program. Where can you get help to overcome my life struggles in Omaha? 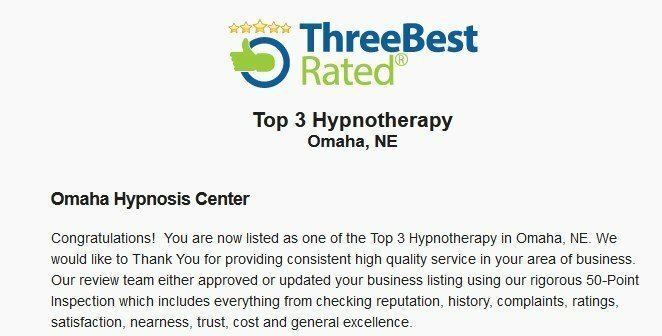 Jeff Martin CH NLP Master and Devan Martin CHT of Omaha Hypnosis Center have offices in both Lincoln and Omaha Nebraska reaching out to include Council Bluffs IA. At our Omaha location, we offer a free hypnosis screening for weight loss, smoke cessation, stress relief, sports enhancement and more. Jeff and Devan Martin have a combined experience of over 40 years in helping people with hypnosis. We have helped thousands of people change their lives. It has been proven for any program to be more effective you need to have a good support system and a confident staff. Not only do they have solid programs as mentioned about but have helped many facing long-standing fears. The fear of flying, the fear of public speaking, helping with sleep problems. These and many more issue can be addressed with hypnotherapy. By means of hypnosis, you can get ideal results while using less work to accomplish your goals. Schedule a free hypnosis screening by calling us or fill out the form and we will contact you.